Fast, accurate weighing in benchscale research tests is helping Columbia-Geneva Sled Division of United States Steel to reach timely decisions on development of reserves, facility requirements, and operational techniques at the lowest possible cost. Among the items of modern laboratory equipment in Columbia-Geneva’s new raw materials research laboratory at Provo, Utah,is a two-dial, weight, loading torsion balance that reduces weighing time by as much as 70.0 per cent. 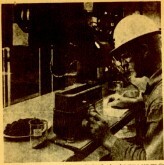 Fine-grained pulps of iron ore, coal, coke, or limestone are continuously weighed both before and after bench-scale tests to determine normal assays and other significant data on available raw materials for iron and steel production in the huge blast furnaces at the division’s nearby Geneva Works. Test Maniples ranging from 50 grams down are weighed rapidly to an accuracy of 5 milligrams. With a simple twist, the laboratory technician adds weights up to 10 grams in one-gram increments with one dial; a second fine weighing dial is graduated in 10 milligram increments up to one gram. With these two simple motions, accurate weight readings of test samples are obtained in 30 seconds on the new two-dial balance made by The Torsion Balance Company. To determine, for example, the quantity of iron oxide present as magnetite in ore samples, this modern research renter emplos s a magnetic tube separator. Ore samples of 10 to 15 grams are weighed accurately on the torsion balance and then charged into the separator, whose magnetic field retains the magnetite present. Nonmagnetic materials are washed out and the residue of magnetic material is discharged, dried, and weighed again on the torsion balance to determine the per cent recovery. Average weighing tune with the new two-dial torsion balance is 30 seconds as compared to 90 seconds required with the 1500-gram doublepan pulp balance previously used. Operation of the old double-pan pulp balance required repeated arresting of the balance and handling of numerous weights back and forth to the pans until they came into balance. The added weights were counted to obtain an accurate reading. With the new torsion balance the weights are dialed and read off directly from the dials. Both dials are operated without arresting the sensitive torsion balance, and an oil dashpot quickly dumps down oscillations to obtain even faster weight reading. Since as many as 150 bench-scale test weighings may be made at the raw materials research laboratory in one day, the savings in time and convenience made possible with the two-dial weight loading torsion balance can be significant. With advanced laboratory equipment of this type, the new research laboratory yields accurate scientific data rapidly ami efficiently for making the necessary decisions required for efficient and economic production of high quality steels. A series of design improvements has been announced for the coloratio pyrometer, an optical-electronic in-strument which automatically converts color detection to temperature measurements. It is being produced by Latronics Corporation. Design of the coloratio pyrometer has been refined to extend the temperature measuring range to between 1000°F to 7000°F, with measuring spans of up to 2500°F. Construction has been modified to reduce photo tube fatigue, and to increase strength and serviceability of the unit.